The fire in 1839 was hugely destructive, and after it the peasants and industrialists of Ivanovo were faced with a major task of rebuilding. One group, the industrialists, also saw this fire and the task of rebuilding as a possible chance to alter their current economic position by changing their relationship with the owner of Ivanovo, Count Dmitri Nikolaevich Sheremetev. 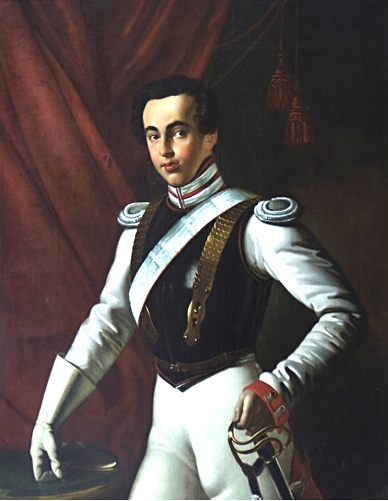 Dmitri Nikolaevich Sheremetev (1803-1871), 1824. From kuskovo.ru, the website of one of his major estates. Most of the industrialists in Ivanovo—that is, most of those who ran factories there—had themselves been serfs of the village. Around 1830, Sheremetev freed twenty serfs along with their families. They all took on merchant status in a town (most in nearby Shuia or Iurevets, a few as far away as Moscow) but continued to live in or near Ivanovo, running various sorts of businesses. Most were manufacturers, and a few engaged in trade, bringing the raw materials Ivanovo needed to the village for future processing. All of those who were still running factories in the village did so based on lease arrangements with Sheremetev. They owned and were responsible for the buildings they had built, but Sheremetev owned the land. The working class of people in the village of Ivanovo, and several manufacturers, considering how useful for the estate the residence in it of merchants from the manumitted serfs of His Excellency the Count, have requested that the estate administration draw up a finding about that, that they do not find any obstacles concerning allowing the merchants to rebuild houses and factories on the places they occupy, for their residence in the village of Ivanovo brings them [the peasants] benefit. truly bring a real benefit to the estate, particularly for the working poor class of estate peasants—an incontrovertible proof of this is the recent example, that [the merchants] in relief of the general disaster created by the fire, in the course of one week, donated for the poor peasants 15,000 rubles in cash and goods worth 5,000 rubles. In the village of Ivanovo which belongs to Your Excellency and outside of it since ancient times we have had residence, and finding ourselves under Your great protection, Most Excellent Count! we have houses and factories, acquired though our long-standing labors, many of which already are in disrepair, and demand rebuilding and significant refurbishment; but on land that does not belong to us to build proper buildings at great cost is not sensible, for every person had the desire to ensure the welfare of his offspring and to put together a solid property. In such a case, feeling Your many benefits and Your most recent efforts at philanthropy, courage has been awakened in us to turn to Your Goodheartedness, and we most humbly and persuasively petition Your Excellency, to grant us permanent ownership of land, which in our calculation is less than twenty desiatins, the largest portion of which is outside the village of Ivanovo, that goes with our houses and factories, for which we ask you to accept from us 100,000 paper rubles. We humbly trust in Your mercy all the more because fulfilling this is closely connected with the greater good of the peasants of the Ivanovo estate, the majority of which work in various capacities at our factories. This petition was followed by a second one which put the matter even more clearly: we lost vast sums and a lot of property in the fire. We want to rebuild, but don’t want to build on land we don’t own. It is in the interests of Sheremetev and his serfs to sell us the land—that would allow us to “confirm our residence in the village of Ivanovo.” And the Ivanovo estate administration also sent in its opinion on the matter: if the merchants decided to pull out of the village and build elsewhere, the peasants of Ivanovo were going to be in trouble. The administration feared disorder would result. Despite this warning, Sheremetev via his St. Petersburg office was having none of it. When reading the second petition from the merchants, someone in the St. Petersburg office underlined the phrase “confirm our residence in the village of Ivanovo” and wrote next to it “Trouble!” Someone—perhaps Sheremetev himself, or one of his agents—was less than enthusiastic even just about the continued residence of the merchants in the village. He was utterly uninterested in granting anything new to those merchants. As a result, in August 1839, the St. Petersburg office produced a response to the two merchant petitions. It was simple. No, Sheremetev would not sell off any of his land. Ivanovo was and always would be (they thought) a single territorial unit. Selling off sections would bring discord and disorder. All land was to stay united. This moment was an important one in the history of the village and the region. It seems to have been one of the events, if not the single most important event, that led some of the local merchants to pull out of Ivanovo proper and begin building in a suburb of the village, soon to be known as Voznesenskii posad. It also led at least one of the local merchants to dig in his heels when it came to rebuilding and paying rent to Sheremetev. His case, which spanned decades, and which I’ll explore over the next couple of blog posts, ends up showing both the strengths and limits of serfdom as a method of social control in Russia.